Small camera supports like the Gekkopod and its more famous cousin the Gorillapod are very useful accessories for shooting with lightweight cameras. And therein lies a tale. 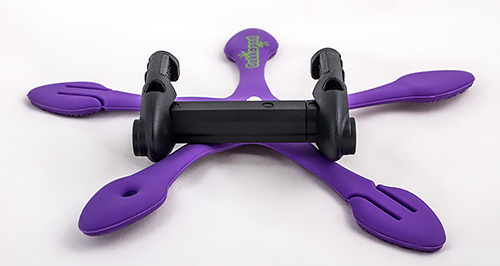 The stability these small supports provide quickly vanishes with a camera as heavy as a Micro Four Thirds camera. Even small dSLRs like a Canon Rebel are too much weight for these supports to hold their grip in unconventional configurations. ZUCKERIM and their retailers are NOT responsible for damage to the device when using this product. Use with CAUTION. Keep out of the reach of children. So be careful with these things. They encourage you to hang your gear in precarious positions but that doesn't mean it's safe to do so. What distinguishes one of these small supports from another is the design of the legs. They all have a 1/4-20" screw for the tripod mount of a small camera or a smartphone bracket. And devices made for phones will also include a bracket to grip the phone that has a tripod mount built into it. The Gekkopod is available in several colors. 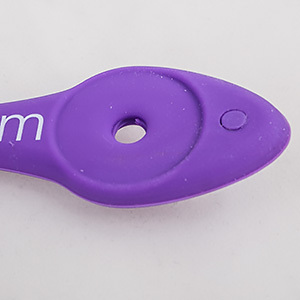 Purple (seen here), green and black are $19.90 while camouflage and glow are $23.90. 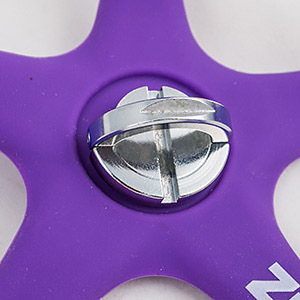 They all include a nice stainless steel D-ring mounting screw which you can use either in the center hole or the hole in one of the Gekkopod's legs. You also need to select a mount. Zuckerim also offers a smartphone mount, a ballhead and a GoPro mount. They're each add a modest $5 more to the price. And another $10 for shipping directly from Zuckerim. Our review unit came with a smartphone mount with a secure grip. The smartphone mount, which was a little nicer than the one pictured on the Web site, opens as far as 3-1/4 inch, which was large enough to accept our iPhone 6s in its Apple case (3-1/8 inches wide). We should note that the D-ring is metal and usually sits under the soft compound of the legs, so if you wrap the legs around an easily scratched surface like painted handlebars, guess what? You can scratch the surface. The Gorillapod doesn't have that problem. 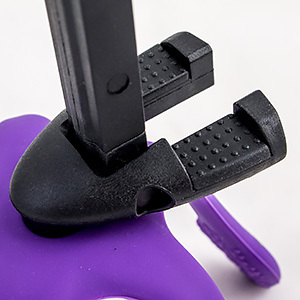 The Gekkopod legs are flexible metal covered in grippy silicon that form non-slip feet at the ends. There are five legs, two more than the usual three-legged tripod. You don't have to use all five (it isn't easy to get them all evenly on the floor) but getting three to support your camera is tricky too because they're in a pentagram pattern. Pick one leg as the head and use the two furthest from it as the other two legs. The feet are not all the same. One has a D-ring hole, two have split toes and four have grips on one side. They do have a little spring in them so they won't close tightly when you wrap them around a handrail, for example. They spring back just enough to maddeningly loosen their grip. 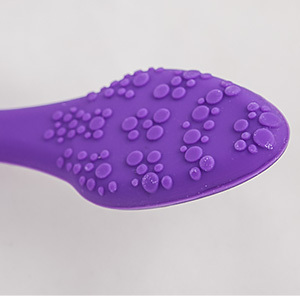 But the non-grip textured feet are great for uneven surfaces. They grip a bit better than the Gorillapod feet, which are balls of soft plastic. Even though wrapping the Gekkopod around things like handrails didn't work quite as well as doing it with a Gorillapod, the Gekkopod's five feet make it possible to create more unconventional support solutions. You can, for example, form it into a chair to hold your smartphone. One nice thing about the Gekkopod design is that you can easily flatten it for transport. There's almost always room for it. You Kill Me. 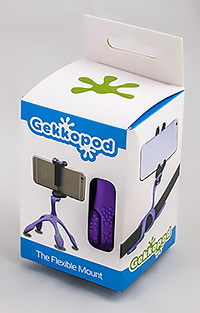 Gekkopod flattened for travel with smartphone mount. One reason for that is that the legs are just three inches long. A small Gorillapod has five-inch long legs. Sometimes we missed the extra two inches a Gorillapod provides. The Gorillapod uses legs made of interlocking balls to hold whatever shape you give them. 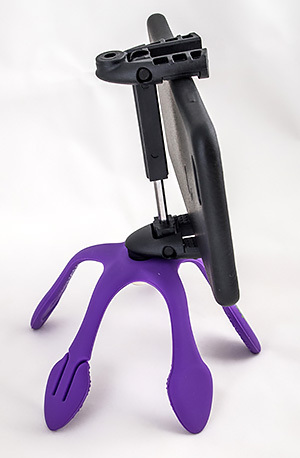 The Gekkopod uses a flexible metal covered in silicon. You can bend the legs freely, even twist them. In fact, two of the feet have toes to give you even more configuration options. Since we have made Gekkopod we have been testing how many bends it takes to break and we realized that because it is so flexible you almost never bend it in the same exact place over and over again! In addition when we tried to bend it in a specific place many times in order to test it, it took over 200 bends in the same exact place very quickly heating up that specific area eventually causing a break, but it will never happened unintentionally. We stress tested the Gekkopod, contorted it into extreme shapes and flattening it back to transport it repeatedly and it withstood the abuse. There was no noticeable sign of wear either. We don't know how anyone uses a smartphone without a Bluetooth trigger. Zuckerim offers one for $7 and that's a bargain. It lets you set up your smartphone on the Gekkopod and snap the shutter without actually touching the device. We give the Gekkopod three corners for its innovative and compact design. If the legs were a bit longer and the metal a bit less springing so they would stay where you put them and the D-ring inset or covered to prevent scratching, we'd give it four.